Powers/Abilities: Adam Crown was host to a Pendragon spirit that granted him heightened abilities, powers and senses which became exaggerated to super-human levels. Adam's physical abilities included enhanced endurance, speed , stamina, and strength. Adam was able to sense the Bane, and he was able to project forth his Pendragon spirit in a manner that exorcised the Bane spirit from Grace by allowing her to share in his emotions. Like the other Pendragons, he was attuned to the workings of nature. He often experienced Pendragon visions warning of various dangers in the future or the present, and across great distances. In this manner, he could sense if any of his fellow Pendragon's were dying. He had the ability to converse with animals, including the sentry owls that populate the Green Chapel. Like his fellow Pendragons, Adam was able to tap into the power of the Earth itself, which manifests as a lighting-like energy referred to as 'Pendragon Fire'. Unlike the other Pendragons, Adam channeled this energy through his weapon, Caliburn. Although Adam hadn't any formal combat training or experience prior to receiving his Pendragon spirit, he inherited some skills from it's former hosts. At the very least he developed a proficiency in hand-to-hand combat equivalent to that of an experienced fighter. He became an accomplished swordsman, leader, and horseman. It is believed the spirit possessing him had once belonged to King Arthur, and he may have inherited other abilities from him. Adam was given a sword of mystical construction (and more than likely supernormal durability) by the Lady of the Lake, which she referred to as the Sword of the Dawn and Adam later referred to as Caliburn. 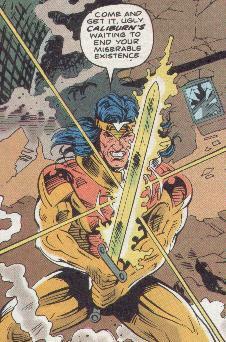 Caliburn gave Adam guidance in the use of his Pendragon abilities, allowing him much greater control. For example, Caliburn made Adam capable of dimensional travel from Earth to Avalon. It also allowed his to use his Pendragon fire in a manner similar to telekinesis. In this manner, Adam was capable of halting a moving car and generating a close range force field capable of levitating and restraining his opponents. The Lady of the Lake also provided him with a suit of armor of unspecified durability. For a time, Adam wore a more sophisticated suit of armor that enhanced his abilities, powers and senses even further. The armour had a battle computer that provided strategic advice in combat and could warn of potential dangers such as harmful radiation. It could also take control of Adam's actions if need be to prevent him killing another Pendragon. The suit reacted to his Pendragon power and moulded itself to fit. It had a fast acting self-repair system that could repair superficial tears in a matter of seconds. The armor adapted to the wearers needs, and was also capable of 'evolving' into new forms, though this only happened once (see comments). After it's evolution, the armor provided Adam with a shield for extra protection. (The Knights of Pendragon I#14, 15, 16, 17, 18) - Adam was working at Frank's wheeler-dealership in Poplar, East London, when a Pendragon vision came to him, warning him that his fellow Pendragons were being separated. His visions led him to the Museum of Pagan Antiquities, and in particular was drawn to a priceless iron age sword. This led to him being two hours late for work. On returning home, he proceeded to take a shower, but was interrupted by a visit from the Lady of the Lake. The next day, late in the evening, he returned to the museum and stole the sword. In his panic to avoid the Police, he threw the sword into a canal. Then, from the murky waters of the canal, the Lady of the Lake held up another sword, lashed together of scrap metal and twisted garbage. This inspired Adam to leave his home and his job and set off on a journey with the sword that would take him across Salisbury Plain, Wiltshire, and ended with him taking a boat into the middle of Blagdon Reservoir, near Glastonbury. Adam writhed in pain, sensing the deaths of fellow Pendragons, as the Lady of the Lake appeared from the depths of the reservoir. Under her guidance, he used the Sword of the Dawn to journey to Avalon and the Green Chapel. Within the chapel, Adam found an empty sarcophagus with the words 'Hic jacet Arthurus, rex quondam rexque futurus' (Latin for 'Here lies Arthur, the once and future king') inscribed on its lid. Adam was reluctant to believe the implication that he was the next coming of King Arthur, but nonetheless was introduced to the Green Knight by the Lady of the Lake. He was fitted with a suit of ancient armor, and sent forth sentry owls to summon his fellow Pendragons. Once all the Pendragons were assembled, he delivered a rousing speech before leading them into battle against the Red Lord and his army of Bane warriors. Adam fought back to back with his fellow Pendragon, and finally came face to face with Grace. He refused to fight her, instead remembering the teachings of the Lady of the Lake. He released his Pendragon in hope, letting Grace feel the passions driving his soul. In an instant, she realized what the Bane had made her as it was driven from her soul. Across the battlefield, many of the Bane warriors started to revert to their human forms. The Red Lord departed with what was left of his legions in tow, and Grace remained with the Pendragons. (The Knights of Pendragon II#1, 2, 3, 4) - Grace discovered an armory in the Green Chapel, triggering an attack by skeletal defense drones. Adam and Albion rescued her, and Grace showed them the suits of armor that the drones had been hiding. They began experimenting in the use of the armor. Later, Union Jack arrived with bad news, and the Knights of Pendragon teamed up with Iron Man and James Rhodes to search for some robots that had gone missing from Questworld. One of the robots had been possessed by the Pendragon spirit that had once resided in Sir Gawain, but Adam and his friends wouldn't realize this straight away. Their search led to an encounter with the Mys-Tech operatives Magpie and Breeze James. After a vicious battle with Magpie, Adam threw his sword at him, piercing his chest and driving him away. Breeze James later convinced Adam to investigate her growing visions of hell on earth. Crown traveled to the Cape Wrath Nuclear Reactor in Scotland only to discover that a horde of Bane was inside the reactor. His armor wouldn't let him enter due to the extreme radiation levels, and it was left to the robotic Gawain to save the day. (Marvel Comics Presents I#122/4) - The Knights of Pendragon investigated the crop circles created as part of the Shadow Wing's Seeds of Winter spell. Shadow Wing confronted the Knights, trapping them inside a mystic field and explained them that they were caught in his spell that only needed the blood of Pendragons to be finished. Afterwards the land they loved would be poisoned forever. Albion attacked Shadow Wing and failed, as did as Grace and Union Jack. Crown didn't attack Shadow Wing himself, who angrily threw his halberd at the hero. Crown caught the halberd and used it to shatter the crop circle. Shadow Wing's spell was broken and the villain retreated through the shadowy mist he came from. (The Knights of Pendragon II#5 - BTS) - After the Cape Wrath incident, Adam and his team-mates returned to the Green Chapel, with the exception of Albion and Grace who diverted in response to an urgent message. While Albion and Grace were gone (they had been lured into a trap by Magpie) Adam and his friends discovered that Breeze James had become a Pendragon, and had donned armor similar to their own. They were even more amazed when the suits of armor began to adapt themselves. (The Knights of Pendragon II#5) - Their armor now fully evolved into their new forms, Adam and the others greeted Albion and Grace on their return from their adventure with Magpie. (The Knights of Pendragon II#6, 7, 8, 9) - During a return visit to Poplar, Adam helped stop a couple of young joyriders who had stolen a car from Frank's lot. As he did so, he and the other Pendragons were summoned to the Green Chapel by Albion. They were mistakenly attacked by Arrakhyl, but Albion put a stop to the fighting, and explained that Arrakhyl was a Pendragon from the world of Arakne. Arakne was under attack from the Warheads, so the Knights traveled to Arakne to investigate. During their initial battle with the Warheads, Adam took a blast from Colonel Liger's gun with his shield. Although the shield easily withstood the damaging blow, the force was enough to knock Adam over the side off the bridge he was standing on. The other Pendragons had no choice but to retreat, thinking Adam dead. Fortunately, Crown had survived his fall by landing on the soft webbing in the caverns below. He was discovered by the Spiridken, whom he rallied to return to the surface and fight for Arakne. Meanwhile, the other Pendragons had recruited Spider-Man. Also, three of the Warheads (Liger, Misha and Stacy) agreed to join them in fighting the Scourge. With the return of Adam and his Spiridken troops, things seemed to take a turn for the better. Unfortunately, the enemy activated one of the Warheads mini-nuke's. The Scourge were ultimately defeated, and the mini-nuke cast into Ley Space. As the Warheads left, Adam warned Colonel Liger to stay away from Arakne and its people for a while. 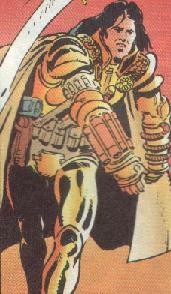 Adam's Spiridkin friends became the basis for a new Arakne Pendragon corps, serving and training under Arrakhyl. (The Knights of Pendragon II#10, 11) - Adam, Albion, Breeze, and Gawain had a small workout against the Green Chapel's battledrones. When Breeze found out that Grace had left for a board meeting at the Omni Corporation she became concerned that it was a trap set by Mys-Tech. She attempted to warn Grace, but couldn't reach her via their communications systems. Adam later took a call from Union Jack, who was en route to Omni to help Grace. Despite Adam's offer of assistance, Union Jack insisted he could handle the situation alone. (The Knights of Pendragon II#12) - Mys-Tech activated the Un-Earth, which affected the Green Knight. The Pendragons found he was dying, and they traveled to London to investigate the source of his suffering. Upon arrival, they found London to be in a state of havoc. They fought a pair of powerful demonic monsters. While Albion defeated one, Adam impaled the other with Caliburn. It turned out the two monsters were intended to be the warm up for a Mys-Tech agent known as Skire, the King of Pain. Skire managed to burn out Gawain, kill Grace and Union Jack, and mortally wound Albion in a matter of minutes. Adam only managed to defeat the villain when he received a temporary influx of power from the Green Knight. Such a desperate gesture on the Knight's behalf made Adam realize how dire the situation was. The Green Knight also resurrected those that had fallen to Skire, and healed Albion's wounds. They made their way to the Museum of Pagan Antiquities, and found Avengers quinjet parked outside along with the X-Men's Blackbird. Realizing the source of their problems lay inside, Adam led the charge into action. (Mys-Tech Wars#1, 3, 4) - Mys-Tech completed development of their Un-Earth, which they then utilized in an effort to take over the world. Across the Earth, the energy backlash was felt by mystics and sensitives, including Adam and his fellow Knights. 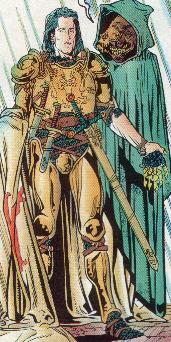 The Knights (or perhaps their alternate dimensional counterparts, summoned by rents in the fabric of reality), arrived in the Museum of Pagan Antiquities, joining an international coalition of heroes against the forces of Mys-Tech, including demons and the Psycho-Warriors. However, Death's Head and Wolverine slew Mys-Tech's Crowe and Porlock; as the Mys-Tech Techno-Wizard's life forces were directly bound to the fabric of reality, their deaths threatened to cause all reality to unravel. Dark Angel proved able to hold together reality temporarily, while the others fought through a horde of Mys-Tech's Psycho-Warriors, making their way to the Un-Earth. There six of the heroes served as surrogate members for the Techno-Wizards to repair the rift in reality. Dark Angel held them together, Professor X provided psychic power, Albion provided Earth magic, Dr. Strange provided sorcery, Death's Head provided cybernetic influence, and Motormouth...well, they needed six of them. The six surrogates successfully repaired the rift and re-formed the Techno-Wizards, set back time so that the many deaths and the activation of Un-Earth never occurred, and put a force field up around the Un-Earth to prevent Mys-Tech from accessing it again. Due to the reversal of time, Adam has no recollection of these events. (Knights of Pendragon II#13-15) - Death's Head was hired by the Lemurians of Earth-313, who desired revenge against the Knights of Pendragon for the damage done to their world. Near their base in the Green Chapel, in Avalon, Death's Head defeated Breeze James and Crown, but was subdued by Union Jack with one of the stasis devices he had brought to contain the Knights. Death's Head was later freed by Magpie, and battled the assembled Knights. The Lemurians then teleported to Avalon to carry out the death sentence they had ordered for the Knights. The two teams fought heavily up until Albion psychically probed a Lemurian's mind. He learned the truth that the Knights were indeed responsible for the destruction done to Earth-313 when they had hurled the Warhead's mini-nuke into Ley-Space. Meanwhile Magpie had sneaked into Green Chapel on his own agenda, and was preparing to summon the Red Lord. He was followed by Death's Head, who had realized the Knights were not the genocidal lunatics that the Lemurians had portrayed them to be. Gawain also sensed the presence of Bane, and the Knights managed to convince the Lemurians to investigate. By the time they arrived, Death's Head had dealt with Magpie, but the Red Lord was almost fully manifested. Crown charged at the portal, stabbing the monster with his sword. In his vulnerable, partially-formed state, the Red Lord staggered back through Magpie's dimension gateway, taking Adam with him. Before the gateway could close, Death's Head tossed Magpie through as well. Then there was one last shuddering blast as the gateway to Annwn closed. Adam's fellow Knights presumed he had perished in the blast. Comments: Created by Dan Abnett, John Tomlinson, Gary Erskine and Bambos Georgiou for Marvel UK. I've listed Adam as a possible mutate because sometimes the Pendragon spirits have lasting effects on a character even after that spirit has moved on. Albion retained the power of longevity, and Union Jack (Joseph Chapman) apparently retained his Pendragon strength for a time. The cover of Knights of Pendragon II#15 boasts "The Red Lord returns... and the death of a hero!". However, all we saw was Adam falling through the dimensional gateway with the Red Lord, with no sign of a body. Even if he did 'die' the Green Knight could potentially resurrect him. However, this still leaves the poor chap stranded in Annwn with the Red Lord and Magpie for company! In his early appearances in the first volume of the Knights of Pendragon, Adam stated he was seventeen. In the second volume, a report compiled by Warhead Ortega stated that he was eighteen (Couldn't he only have been a couple months or a week away from his eighteenth birthday in his first appearance?). Considering that little time had passed in the comics, I think Ortega likely got her facts wrong. Due to the sliding timescale he's more than likely still in his teens... should he ever return that is! If he ever did return, it is believed that the Pendragon that possessed Adam, and King Arthur before him, has been passed on to the Black Knight (Dane Whitman). This being the case, Adam will likely have lost the majority, if not all, of his powers. I haven't re-read all of the issues to see exactly when the Marvel Comics Presents#122 issue fits in, but it would seem to be after Grace joined and they got the new armor (KoP II#1), but before Breeze joined (KoP II#5). However, KoP II#1-5 pretty much continued directly into each issue, with only small breaks. It could be that Breeze was just absent from the mission against Shadow Wing, or it could be that MCP#122 took place during a break in #1, #5, or elsewhere. Definitely after KoP II#1 and before KoP II#15, anyway.